Snag! Why Keep That Dead Tree in Your Yard? Further, many birds raise their offspring in the cavities or tree holes that are excavated by woodpeckers. 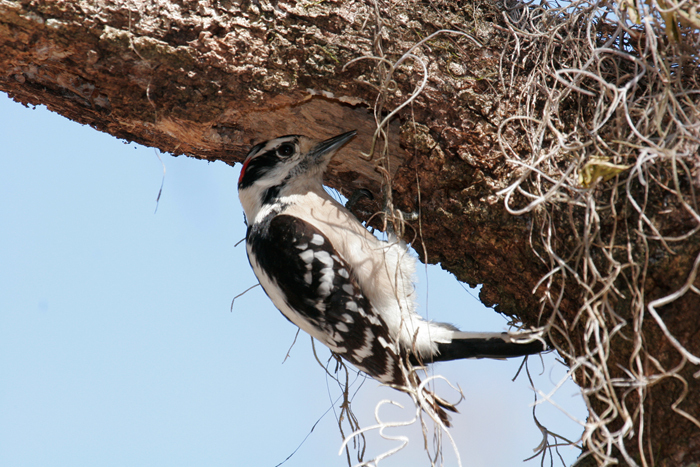 Primary cavity-nesters, such as woodpeckers, excavate their own tree holes, usually in dead or dying trees. Secondary cavity-nesters, such as titmice, chickadees, owls, great-crested flycatchers, and others, don't make their own cavities but use cavities excavated by primary cavity-nesting birds, or they use natural cavities. Thus, retaining snags in a neighborhood benefits a wide variety of species by presenting them with foraging and nesting opportunities. If safety is a concern in leaving snags standing, then ask a tree surgeon to cut the tree to a height that will not hurt your house. Don't have any snags? If you do not have dead tress in your yard, bird boxes could be installed on trees or posts. Also, you can create "hard" snags in your yard. This is where the top 1/3 of the tree is removed and some of the side branches; this creates ideal conditions where the inside of the tree begins to decay first. A "hard" outside with a soft inside is ideal for cavity-nesting birds. You can even "plant" a downed tree in the yard to provide a snag for species. Spread the word in your neighborhood. Many trees are cut down without much thought to their value for wildlife. Make an effort to keep snags in your yard. Once accomplished, place signs that state "woodpecker habitat," such advertisement will entice other residents to take up the call and conserve snags.